Thanks to the wonderful world of social media it has come to my attention that today is Croissant Day and I really couldn’t let that past without a small celebration. 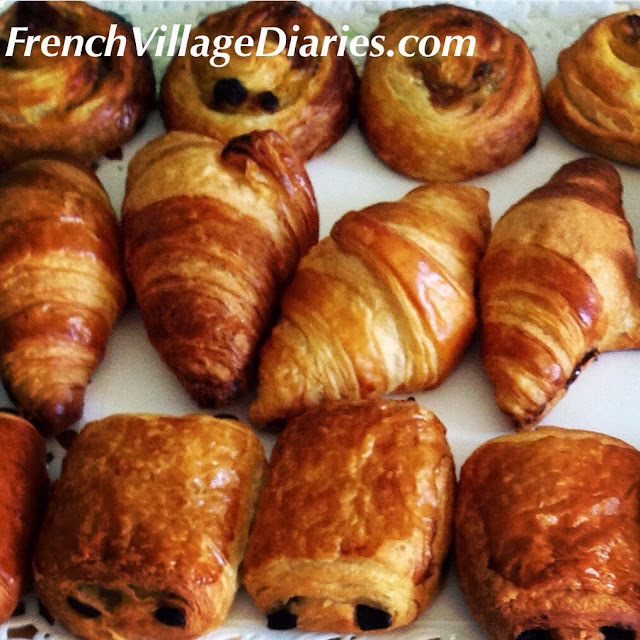 I am still in love with the buttery, flaky croissants from our village boulangerie, even after ten years of living almost next door, oh yes, I am close enough to smell them as I open the shutters in the morning. My perfect day would begin with a fresh coffee, a square of dark chocolate and a warm croissant, in fact I would happily start every day like this, but the calorific content means it is something I have learned to savour and enjoy on a Sunday or a special occasion only. We are a little bit of a divided household when it comes to how to eat the perfect croissant. 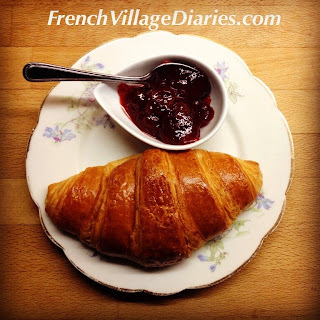 Ade and Ed are red jam men and slather their weekly croissants with strawberry, cherry or plum jam. Raspberry is occasionally considered, but only if it is seedless. 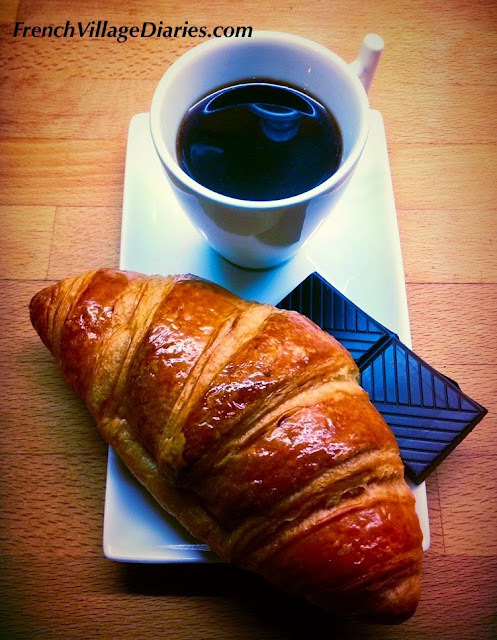 I am of the opinion that a croissant is so perfect that apart from the coffee and dark chocolate it needs nothing more, except perhaps a sunny terrace on which to eat it. What we are all in agreement of is that a croissant must never be dunked into your coffee, what were the French thinking of! 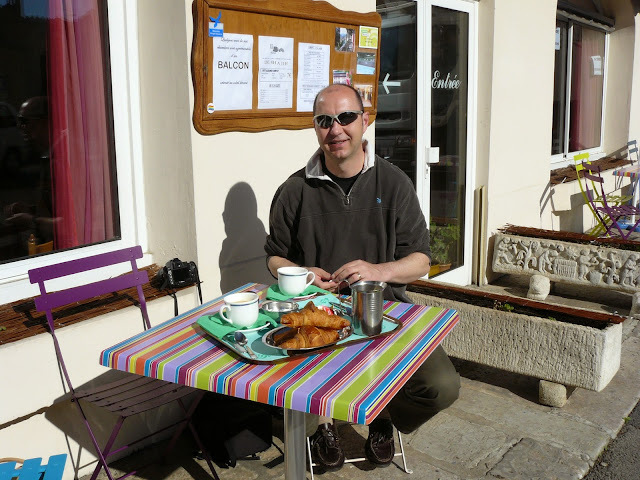 I do have a little tale to tell about a croissant breakfast taken in the Cevennes on one of our road trips. Holidays are deemed to be special occasions so a croissant for breakfast becomes the norm when we are on a road trip. When we checked into the small hotel in Meyrueis we said no to their full breakfast and started the following day with a lovely walk around the village and a bit of people watching as the market was setting up. We then returned to the hotel where their small terrace was bathed in early May sunshine and asked Madame if it would be possible to have a coffee and croissant on the terrace. She assured us this was no problem, so we sat ourselves in the sun and waited. After quite a wait we were beginning to wonder just how long it took to pour a couple of coffees and plate up a couple of croissants. It was then we saw Monsieur pull up on his bike with a bag of croissants in his hand, fresh from the boulangerie we had walked past down the hill. Oops! We did feel rather guilty, so made sure we enjoyed every mouthful.